The Arkansas Symphony Orchestra (ASO), Philip Mann, Music Director and Conductor, presents the fourth concert in the 2014-2015 Stella Boyle Smith Masterworks Series: Tchaikovsky and Mozart Festival. The concert takes place at the Maumelle Performing Arts Center on Saturday, January 31, 2015 at 7:30 p.m., and Sunday, February 1, 2015 at 3:00 p.m. 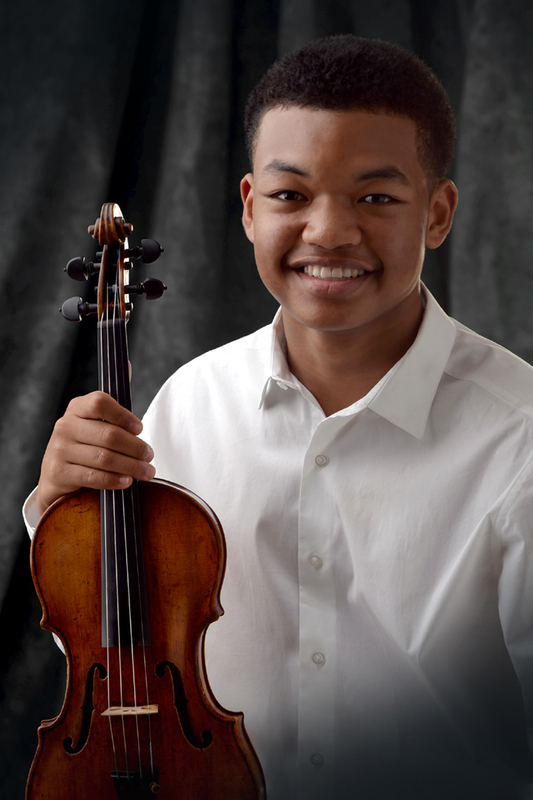 The ASO, under the baton of guest conductor Vladimir Verbitsky, is joined by young violin virtuoso Randall Goosby for Mozart’s Concerto for Violin in A Major. Tchaikovsky’s Polonaise from Eugene Onegin and his epic Symphony No. 4 are also presented on the program. The Masterworks Series is sponsored by the Stella Boyle Smith Trust. The concert sponsor is the National Endowment for the Arts. Tickets are $19, $35, $49, and $58; active duty military and student tickets are $10 are can be purchased online at http://www.ArkansasSymphony.org; at the Maumelle Performing Arts Center box office beginning 90 minutes prior to a concert; or by phone at 501-666-1761, ext. 100. All Arkansas students grades K-12 are admitted to Sunday’s matinee free of charge with the purchase of an adult ticket using the Entergy Kids’ Ticket, downloadable at the ASO website. Eugene Onegin is Tchaikovsky’s most popular opera, and the Polonaise is heard during a ballroom scene in Act Three. Mozart composed the last four of his five violin concertos in December of 1775. With lyrical intensity bordering on the operatic, a slow and heartfelt true Adagio, and a firey, virtuosic rondo in the style of a minuet as a finale, Violin Concerto No. 5 is the most accomplished of its brethren. Join the Oxford American magazine for the continuation of their 2014-2015 jazz series at South on Main featuring Peter Martin & Romero Lubambo! This special evening will include a live multi-camera video shoot of the showby AETN – Arkansas Educational Television Network. The OA jazz series is sponsored by the University of Central Arkansas College of Fine Arts and Communication. Doors open at 6:00 PM with dinner and drinks available at that time. The concert begins at 8:00 PM. Single tickets went on sale September 1 at $30 for reserved seats at tables and $20 for general admission. Purchasing a reserved seat assigns you to a specific guaranteed seat at a table. However, seating at tables is family-style, and unless you purchase the entire table, you will be seated with other patrons. General admission tickets are good for barstools and standing room, available on a first-come first-served basis.For ticketing questions, please contact Metrotix at (800) 293-5949. Raised by parents who are both classical musicians, Peter Martin began studying music at the age of three. After graduating from high school, Martin received the Presidential Scholar in the Arts Award from President Reagan. He then attended The Juilliard School in New York on scholarship, studying piano with Martin Canin, until moving to New Orleans in 1990. While in New Orleans, Martin honed his skills working with key musicians such as Nicholas Payton, Germaine Bazzle, Brian Blade, and Victor Goines. He also embarked on an active solo career and toured and recorded with artists such as Betty Carter, Wynton Marsalis, Dianne Reeves, Chris Botti, Joshua Redman, Christian McBride, Roy Hargrove, and the Jazz at Lincoln Center Orchestra. Martin has performed with the Berlin Philharmonic, the Chicago Symphony Orchestra, the New York Philharmonic, and the Sydney Symphony, as well as numerous other orchestras around the world. He’s also played at The White House twice. In 1985, Romero Lubambo came to the United States, and brought with him a new sound in Brazilian jazz guitar. His guitar playing unites the styles and rhythms of his native Brazilian musical heritage with his fluency in the American jazz tradition, forming a distinctive new sound. From the cool, sophisticated rhythms of his native Brazil to hard bop, Lubambo is a guitarist who’s comfortable in any musical setting. He is an uncommonly gifted soloist and musical improviser with a steady stream of unpredictably creative musical thoughts and the virtuosity to deliver them ever so tastefully. Lubambo has performed and recorded with many outstanding artists, including Dianne Reeves, Michael Brecker, Yo-Yo Ma, Kathleen Battle, Diana Krall, Wynton Marsalis, and Paquito D’Rivera among many others. Each month, the Museum of Discovery stays open late for an event geared for adults. Science After Dark, held the last Thursday of the month, is for the grown-ups. Why? Because, science is fun…at any age! The event takes place from 6pm to 9pm tonight at the Museum of Discovery. Science After Dark provides visitors the opportunity to have fun and learn about science in a unique setting. Museum educators pick a science-related topic and build an entertaining, interactive evening around it. You never know what will sprout, pop, fizzle, or glow. We invite you to discover the science of having fun. 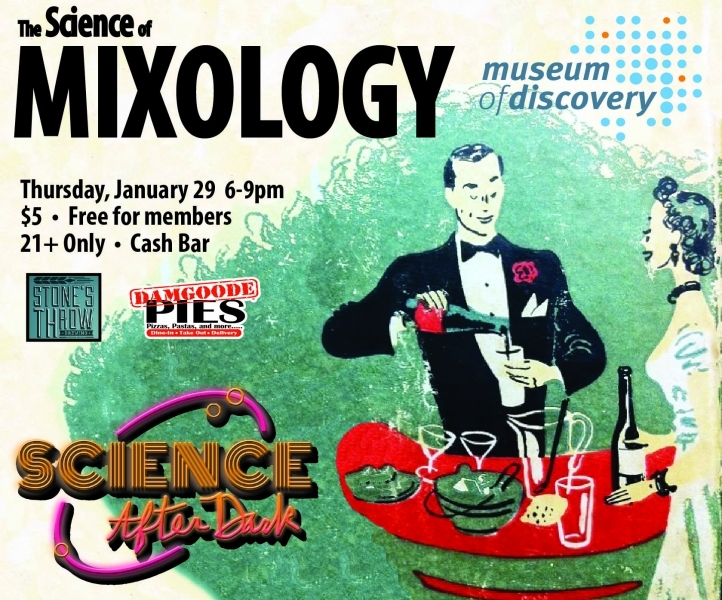 This month, just in time for Super Bowl and Oscar parties – Explore the science of cocktails and mixology at the first Science After Dark of the year! This month’s Science After Dark will include mixology with Louis Uzcategui of Big Orange Midtown, molecular mixology with Chef Stephen Burrow of Forty Two, distilling with Rock Town Distillery, the history of prohibition with Old State House Museum, density columns and more! On January 29, 1797, future Little Rock Mayor William Wilson “W. W.” Stevenson was born in South Carolina. In 1811, he came to Arkansas when his family settled in Batesville. An ordained Presbyterian minister, he married Ruana Trimble in 1821 and had two children. After she died, he married Maria Tongray Watkins in 1831 and had two more children. 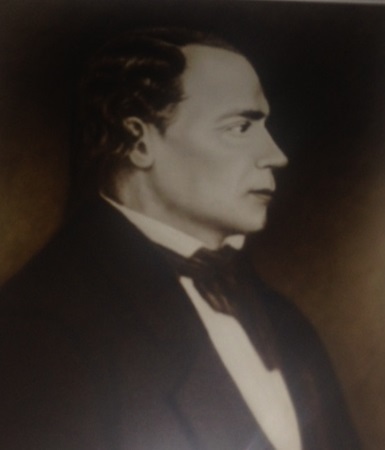 In 1831, he ran for Little Rock Mayor in the first election for the office but was defeated by Dr. Matthew Cunningham. The next year he ran to succeed Cunningham and was elected. After leaving the Mayor’s office on December 31, 1833, he continued public service. He was State Commissioner for Public Buildings in 1839. 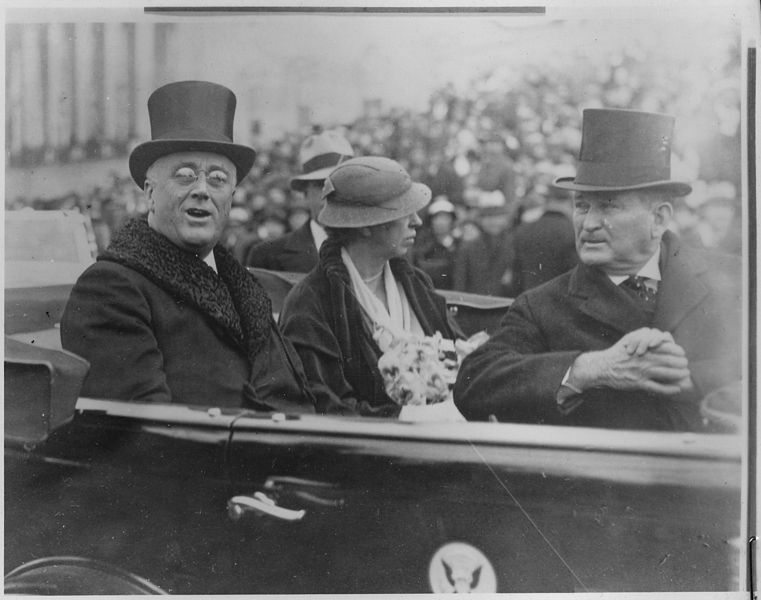 In 1849, he delivered the funeral oration at the ceremony for Hon. 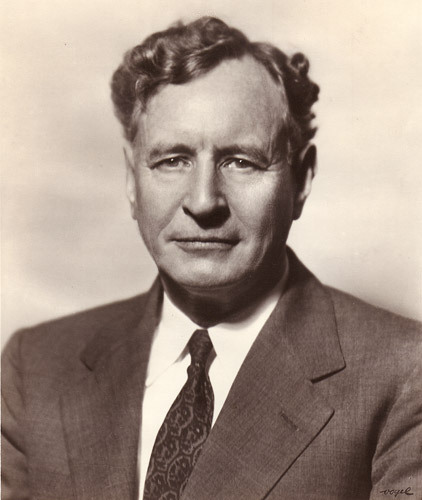 Ambrose H. Sevier. Later that year, he was hired as a geologist for the Little Rock and California Association which was created to take advantage of the gold rush. He and his two oldest sons moved to California and never returned to Arkansas. He died in 1888. The next edition of the Old State House Museum’s continuing Brown Bag Lunch Lecture series takes place today. The Museum’s staff member Cris Slaymaker shares the story of Little Rock’s Union School. During the American Civil War and into Reconstruction, Christian missionaries from the North took up the mantle of educating the newly freed former slaves. In Little Rock, missionaries accepted the roles of both teaching and administration for the already existing black school, the Union School. Their efforts over the next few years paved the way for the public education of African Americans in Arkansas. Cris Slaymaker joined the Old State House Museum education staff in 2012. She earned a BA in Spanish from Lyon College, and has studied in the Public History master’s program at UALR. Cris has previously served on the staffs of the Old Independence Regional Museum, Arkansas History Commission, Arkansas State Parks, and Historic Arkansas Museum. The Old State House is an agency of the Department of Arkansas Heritage.